The reunion was attended by several of the sport’s principals from the day and were introduced to the crowd. Several of the old race cars were on display and two of them, both formerly displayed at the Hall of Fame, put in some demonstration laps to the attendee’s pleasure. The cars on hand were the big-block powered Black Widow #V8 of Ellis Palasini, the Andy Anderson built #44 which was regularly driven by Ival Cooper with others such as Armond Holley at the wheel. Also in attendance was the #7 that was driven by local hero, Jake Hatcher, before his death in a racing accident, as well as the CAE car #12 that was driven and owned by Mississippi legend, J.D. Parker. The #11 Hilbilt owned supermodified was a popular hit at the reunion. This car was campaigned by Louisiana’s Mickey Carrier and was driven by Ronald Ellsworth. Mickey Carrier owned this supermodified driven by Ronald Ellsworth. We know….there’s stockcars in this shot. We couldn’t resist showing off all of these beautiful handbuilt models though. 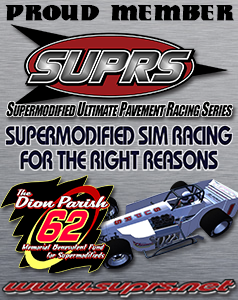 A little southern supermodified humor. A perfectly scaled diarama of the old Jackson, (MS), Speedway featuring a huge field of southern supermodifieds! A few legends of southern supermodified racing. Mobile’s most famous car owner, Johnny Ardis, was among those introduced to the spectators prior to the start of the Must See Racing Xtreme Sprint Series feature event. Ardis has been fielding cars for over sixty years and has had many of the best racers in history behind the wheel of his winning cars. Among his drivers are a couple of brothers who are generally considered as stock car drivers – Donnie Allison and his brother Bobby Allison. Johnny is considered as the only entrant from Alabama in the iconic Little 500 held at Anderson, (IN), Speedway in central Indiana. Johnny entered his cars at total of five times at this spectacular race that features 33 starters taking the green flag three abreast and racing for 500 laps on a 1/4 mile high banked oval. A moving rendition of the National Anthem was sung by former driver, Hugh Richards. Richards won many supermodified races including the Liberty Bell 300 at Houston, TX. He also set a 1/2 mile speed record at Five Flags Speedway in 1972 when he turned a 16.30 lap in his supermodified. Get that? A singing race car driver. Accompanying Hugh’s perfect vocals trackside was the sound of the beautiful #44 carrying the American Flag while being driven by Ival Cooper’s son, Gary. The car which is breathtakingly restored features a nickel-plated frame and cage, the results of its former plating company sponsorship. Interestingly, the car was converted to dirt track racing and driven by ace driver, Tommy Noblin. Closing out the program for the legendary racers, was the interview with Mississippi top shoe. Ellis Palasini, whose fifty year old racer was being driven in front of the crowd by his son Duke. Ironically Duke had never been behind he wheel of his father’s historic machine. The smiles on both of their faces after the event was priceless. Another happy driver was Donny Bean who joined Duke on the track in the #44 which he restored and now owns. The memories were countless indeed, and many fans and reunion members expressed their thanks and gratitude to Five Flags Speedway for the opportunity to relive a part of southern supermodified history. Plans are already being made for a repeat in 2014.